"There were people in his inner circle that were concerned that if this information came out, people wouldn't book him for fear that he would have bad shows," says Raymond. "There were concerns that it would it would hurt him. And since he decided to make the diagnosis public, it's been nothing but the opposite." I sit here wondering? What effect are the announcements by Glen Campbell and Pat Summitt that they are living with dementia having on the general public? Are these announcements and stories changing the stigma that is sometimes attached to Alzheimer's? I wonder, is the message getting through -- there is life after a diagnosis of dementia. I know that attitudes and behaviors change slowly. This is especially true when people are uninformed, uneducated. It seems to me that Alzheimer's is beginning to come out of the dark and into the light. I am reminded that stigma was attached to cancer and HIV/Aids. Here is a very good audio story on Glen Campbell, transcript included. In his new album's liner notes, Glen Campbell writes, "Ghost on the Canvas is the last studio record of new songs that I ever plan to make." That's because he's now living through the early stages of Alzheimer's. A man whose music history spans six decades is slowly losing his own history — his memories of being one of L.A.'s top session guitarists, playing on everything from "Strangers in the Night" to "Good Vibrations," with an outfit called The Wrecking Crew. "I got to play with the best musicians that I had ever played with. I'll just go ahead and say it," Campbell says, laughing, "they were the best musicians in the world!" Of course, Campbell's memories also include a solo career and songs, such as "Wichitaw Lineman" and "Rhinestone Cowboy," that made him a household name. "Everything is fine," Campbell maintains. "I'm cool. It's just a period I'm going through in my life, you know. I've hurt big toes worse than that." 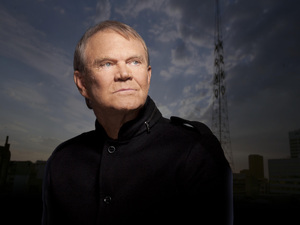 At 75, Glen Campbell still retains his signature charm, his sense of humor. But more and more, he relies on his wife, Kim, for the details of his life. Kim and Glen have been married for more than 25 years. She's his fourth wife — and the one credited with getting him off of the drugs and alcohol that derailed his once stellar career. Kim says that Glen's decision to share his diagnosis with the public didn't surprise her. "Glen's always been really open about his life and his ups and downs, his struggle with drugs, finding God. This is just a natural thing for him to do, to let his fans know what's going on with him in his life," Kim says. "It took us two and a half years to make Ghost on the Canvas, just because we were really careful to find the right songs to say what he wanted to say," says Julian Raymond, Campbell's co-producer and co-writer on the album. "We really wanted it to be indirectly kind of a life story. "It's sad knowing that he probably won't be doing this anymore. He won't be able to play that amazing guitar that he does and sing with that beautiful voice. But he's an upbeat, happy guy, and we didn't really think too much about it other than trying to make the best record that we could." Raymond helped write five of the album's songs. He says Campbell has never considered himself a songwriter — more of a "song doctor," as he puts it, who works with writers to bring out that Glen Campbell sound. Occasionally, as with the song "There's No Me Without You," the lyrics fall out of him without his even knowing it. "Funny thing happened," Raymond recalls. "We were standing in the kitchen of the studio one day, and we were talking about his wife Kim. And she walked in the room while we were talking, and he goes, 'You know what? There's no me without her.' So I mean, he always comes up with these little sayings, these little things, and I wrote them down." The album took a long time to record, but Raymond says that had more to do with acquiring the right cover songs than with Campbell's condition. "We never had to stop a session because he wasn't on it. He did it. He just occasionally would get frustrated with himself: 'Why am I doing this? Why can I not remember this? This is so easy!' You know? He just got tough on himself sometimes." Glen Campbell is taking his new music on the road for a concert tour — perhaps for the last time — in spite of his advancing memory loss. Doctors say that playing show after show could actually help. Playing guitar, singing, constantly flexing those muscles may improve Campbell's memory retention. Another benefit to life on the road: Many of Campbell's children perform in his backing band. "It's great playing with the kids 'cause, you know, I showed 'em how to play," Campbell says. "And all of them are just good, good players. So I look forward to going out on the road with them." Kim adds, "I think they're really cherishing being out there with Glen too, 'cause, you know, this could be his farewell tour. They try to be strong for each other." Campbell's tour takes him, and his family, to Missouri and Arkansas next weekend.